Jobs! Jobs! Jobs! The Government's Plan? Hello Everybody. My name is Brian Kelly and I am running for the US Senate. Some may call me a mild mannered professor at a fine Northeastern PA University. But, regardless of what I am called, the message in this essay is Jobs! Jobs! Jobs! And, by the way, like a lot of Americans trying to cling on to a job, I have been dumped after seven years working for the same University. The irony is that I retired three years ago, and they begged me to come back. At 63.5 years old, I thought I was going to end my career at Marywood but things happen. Don't worry, I'll be fine. After about ten years, they had their reasons. I hope to spend the next six years in the US Senate working for the people. I am 63.5 years old and I am able to collect social security now but I am not ready to retire. I had been hoping to put in about two more good years of work, maybe four. Now, I am thinking about one thing: beginning my new six-year Job on January 3, 2013. There are two things that might mess that up. You may not hear my message, which would make it tough for me to become your next Senator, or Congress may pick a different start date. If the folks decide to send me to Congress for six years to serve in the Senate, I can promise two things for sure. Nobody will own me and I will work for you -- the people of Pennsylvania. So, why can't I know when I can start working for the people of PA? I am not sure now when the first day of work for the 113th Congress will be scheduled. I should know but Congress is a fickle body. I’ll tell you how the date is supposed to be determined so you can be upset about another Congressional usurpation of the Constitution. This is a few paragraphs long. It gives all of us a lesson in politics. The Constitution (20th Amendment, Section 2) mandates that a new Congress convene at noon on January 3 in each odd numbered year, unless it has earlier passed a law designating a different day. The 111th Congress, the most corrupt of all time, for example, convened on January 6, 2009. The 112th Congress convened on January 5, 2011. One would expect that the 113th Congress, which I hope to join, will convene on January 3 2013, as it should, since it is in the later part of the first week of the year. But, who knows, Congress likes to relax while Rome is burining. I find it interesting to say the least and derelict to say the worst that Congress chooses its own date when the Constitution picks a consistent January date for “eternity,” which is January 3. I might add that this date is far enough from the holidays to not create a hardship. How may of us are back to work sooner than January 3. As such, representatives, eager to serve the people should have no problem being called to muster. So, what is the problem all about – the power of Congress or the Constitution? I vote for the latter as the slippery slope of a discordant congressional activity has slid far enough. The people want reins on Congress. They are not English Lords but mere representatives of the people, from the people, and answerable to the people, according to the Constitution, which unfortunately, they often choose to ignore. Please tell me why in recent years, it has been the exception, rather than the rule for a new Congress to begin on January 3. Eight out of the last nine Congresses including the 104th ( January 4, 1995), the 105th(January 7, 1997), the 106th (January 6, 1999), the 108th Congress (January 7, 2003), the 109th (January 4, 2005), the 110th (January 4, 2007), the 111th Congress (January 6, 2009), and the 112th Congress (January , 2011) have not followed the Constitution. If we see the next Congress taking the reins on January 3, then we will know the people are beginning to make an impact on Congress’s independence. When you and I look at the Congress of these United States during the Obama Administration, I bet we both think that nobody is thinking. Issue after issue from bailouts to the big pork bill to the huge energy tax, and then the preoccupation with making the US health system into another Post Office, I have found the Congress, including the long serving Senator from Pennsylvania (Arlan Specer), replaced in November, as well as the newest Senator from PA - Robert P. Casey Jr. voting for things that you and I know are wrong. All the while all of this "reshaping" of the US has been going on, through April 2010---fifteen months into the Obama Administration, Congress and the President pretended that the country was at work and that these were normal times. They concentrated on their socialist agenda rather than helping Americans get back to work. Only once, formally, did the President say that Jobs were the most important item on the agenda. That was at his now famous first State of the Union Address. But then again, he is now recognized as the best of the best of politicians, and that is because he lies better than the best. Even after he lies to you, and you are 100% convinced that he is a liar, you still want to believe him on the next lie. That is how good the Prevaricator in Chief has become at his craft. President Barack Hussein Obama delivered the 2010 State of the Union Address on January 27, 2010, to a joint session of Congress. It was the President's first state of the union but his third time before a joint session of Congress after taking office in 2009. The President delivered the speech on the floor of the United States House of Representatives in the United States Capitol and it was aired on all major networks. Most Americans, in fear over the economic recession, anticipated that the President would offer a solution to our woes and hopefully, it would be workable, and hopefully, he would not be kidding about it. On cue the President touched on two of the hot topics on everybody's mind. During the speech, Obama covered major proposals for Job creation and federal deficit reduction. A fly on the wall would have thought that finally after 15 months on Obamacare, after the Scott Brown election, and polls pleading to not move forward on this poor legislation, the country was going to move to a solution that would mean Jobs! Jobs! Jobs! The first two items were about energy and the third was about the President being annoyed that some American corporations were not repatriating their earnings in foreign countries. In other words, the US was not getting the proper tax revenue. So, the only apparently meaningful thing in the president's speech on Jobs was actually on something else. Getting the tax revenue in that was deserved would be nice but it would not create one more job in America. It was simply an Obama diversion. The next point in his speech on Jobs was to "encourage American innovation." On the surface one could see how this could help the Jobs situation. The funny thing about the comment is that Americans have always been innovative. Look at the list of inventors and inventions of Americans from electricity to the iPad. In the write-up of the State of the Union, as a clarifying point the part about encouraging American innovation had a subtle subtitle (focus on clean energy). Was he kidding? 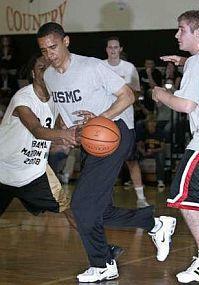 Michael Moore, the well known filmmaker and liberal thinker loves using the basketball analogy to describe Obama. Moore says that many times President Obama "fakes right and goes left." In other words, this artful speaker is often all words and no action or after the fake, he goes after a completely different action. Once he's convinced the folks that he is doing one thing, the folks relax and then he pulls the fake and goes left, Because of the mainstream, anti-American media ( ( MSM, in this country, the Prevaricator in Chief often gets away with lies because nobody expects him to be so obvious. During the 2010 State of the Union, it was another Obama head fake. It turns out that there were few bullets of substance on Jobs!. He used the perfect three-pointer touch simply for lip service. His Jobs message was not a jobs message. It was a big head fake. It was an energy message as Monseuer Obama was so desirous of having the Senate pass the Jobs killing Cap and Trade bill that had already passed the House, he would lie to his most cherished in much the same way as the rest of us lie about Santa Claus. Lying to us for the Master, by now, is old hat. Now that we have introduced the notion of lies and the Donald has flushed out the birth certificate, are we permitted to mention that the Prez has stopped all US oil activity, yet he is looking to blame someone else for the oil and gad price problems of today. Maybe Bush did it! Yes, just like Alfred E. Neuman Jr. he is looking around and researching relentlessly to see if he can pin any of this on George Bush, the man from W.
If the President was interested in building nuclear power plants or exploring off-shore areas for oil and gas, we would already be building nuke plants and we already would be seeing the rigs off shore. He fakes left and goes right. 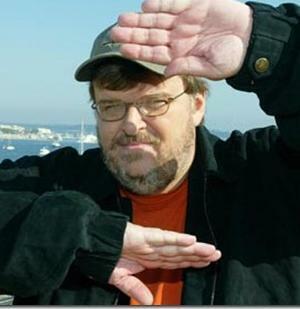 Michael Moore has fim pegged right (whoops, correctly). He goes left every time. Sorry folks, but on the Jobs thing, he was just kidding. Then, you may recall from recent history, that Obama got more personally involved into the Cap and Trade energy issues as he asked for more investment in advanced biofuels and clean coal technologies. American power is dependent on coal for sure but it is not clean coal at this point. So this has nothing to do with solving today's Jobs problem or today's energy problem. But, the President is the president and thus he has the bully pulpit from which to lie, and he does. But Michael Moore calls it a head fake, rather thana lie. Biofuels are a real joke as it takes substantial fossil fuel energy to produce these fuels. Americans must keep their eye on the ball. This guy, a.k.a., the President, just gave another head fake. The fact is the recent focus on clean coal has nothing to do with getting more energy or getting more Jobs. The focus is on the carbon dioxide that is produced from burning coal due to its impact on global warming, which inconveniently, is all bull in the first place. Whoops! There goes that head fake again. He was not talking about energy or Jobs. He was talking about global warming. Whoops, there goes a million kilowatt head fake again. What can we believe from the president? Not much folks! We are victims of institutional lying from the highest levels of government on down. You got to trust yourself or somebody you really really really trust! Call it a head fake if you like. Say, he just faked right and then went left if you like, But in Pennsylvania we have a name for that. It is called a lie. People who do things like that are not called head fakers, they are called liars, plain and simple. Yes, Obama was kidding about Jobs and from January through April 2010 that was the last of his Jobs messages. He had more important things on his mind --- Obamacare. . So, on January 27, 2010 we got the "I am the Jobs Man Message." But, he was kidding. Sorry! You may recall that the news of the big nothing Jobs plan did not even have a chance to hit the next day talk shows before Nancy Pelosi could contain herself no longer. On January 28, 2010, most people had not yet gotten the Obama Jobs message when, bursting with self pride, the Madame Speaker purposely puppetted an overly prepared parody of herself and Obamacare to the American people. I love alliteration. Having listened to the State of the Union and its mention of Jobs, I originally thought that the Speaker was off message. Maybe she had not gotten the Jobs message that Obama was putting forth. Nope! She knew that it was just a head fake. She read it better than any of us. Her wait was over. These are words from a person once known as "Pelosi the great"
[Despite what president Obama said last night, that was January 27 and that day is gone. Today is January 28 and this is a new day. ] "We will go through the gate. If the gate is closed, we will go over the fence. If the fence is too high, we will pole vault in. If that doesn't work, we will parachute in. But we are going to get health care reform passed..."
She did not mention Jobs once! Nor did she intend to mention Jobs! And, Robert P. Caey Jr., when he got the chance, did not poke her in the shoulder and say, "Hey, what about the Jobs?" Hey Bob, What About Jobs? This is the crap that is killing our country and killing Jobs throughout the country and big time in Northeastern Pennsylvania. He might not like to admit it but our Senator voted many times too often in the last few years for items that Nancy Pelosi asked Harry Reid to introduce to the Senate. Instead of working for Pennsylvania and the people of the United States, our man Casey had his own agenda. Could the huge contributions from Wall-Streeters to the campaign war chest have anything to do with that? What promises did Harry Reid or Barack Obama give to Bob Casey Jr. to get him to switch from his staunch pro-life stance? Maybe Casey has no principles??? The only time our incumbent Senator did not vote the Pelosi / Reid way was when one of them gave him a pass for the folks at home. Casey went all the way on the anti-life provisions and did not assist on the healthcare abortion amendment authored by Bart Stupak of Michigan. And now, both Stupak, who at least had the grace to retire in disgrace, and Casey, when he goes to church, I suspect, are shamed by their vote. At least Stupak did the right thing by quitting. The original Stupak amendment prohibited Obamacare from funding abortions through taxpayer dollars. Even opportunistic Congressman Kanjorski voted for that. Casey, on the other hand when the big bill came though and his freind Barack Obama sent down the orders, the Senator forgot he was pro-life. Thankfully the new Democrats gave Casey a breath of life as they suggested that he does not have to admit anything. Just lie a little. Does Robert P. Casey believe he voted for an anti-life bill. Ask him. Then, ask Pennsylvanians for Life or the National RIght to Life. This is a failure that is being paid for by all Americans especially those of us in Northeastern Pennsylvania. Now that the people have begun to keep score, It's time we got some passing grades from Congress. Yet, in their arrogance they are still trying to jam stuff we do not want down our throats. Just like many of you, I say, Throw the Bums Out! And that means our own incumbent must also go. Where are the Jobs Mr. Casey? Where is the protection for the unborn from Obamacare? Where is the discourse and debate about the Jobs programs Mr. Casey? I thought about how I could help. I've got a ton of Jobs solutions and they are scattered through the Jobs book I wrote. One way you don't create Jobs is to pass a $3 trillion health bill. That is a real Jobs killer and American Corporations such as Caterpillar and Verizon and AT & T are already thinning their ranks specifically because of the Jobs killing legislation put forth by Nancy Pelosi, Harry Reid, and seconded by Bob Casey Jr. . I thought long and hard. I chose to make myself available for service to our country. This is the right time of my life. I am schooled on the issues. I am ready to bring the hijacked government of this United States back to the people. I hope that 32 or 33 other new people join me in the Senate on January 4, and I am glad Ron Paul got reelected and I hope he becomes the defacto leader of the House. He's prettier than Nancy Pelosi anyway and he seems much more attentive and tuned in that John Boehner. Why is it that today's Congress is not interested in creating more Jobs for American prospective employees? Why is it that today's Congress wants to give all of the earnings of the working man to the non-worker? There are two answers. Philosophically many Democrats have become socialist progressives and more and more on the hard left espouse Marxism and Communism. They see this as their calling. Their goal is not to create more Jobs but to create more people looking for Jobs! That is their way to make more Americans dependent on the hand of the government and unfortunately, they are succeeding. When you are fortunate enough to be employed, the goals of the progressives affect you differently. They want to redistribute your wages to the guy down the street who sleeps all day. The second answer is that they buy votes with your money by giving it to somebody else. This is not my Democrat party or yours. They also believe in healthcare redistribution and though nobody talks about it like this, Congress does not want your employer to give you healthcare benefits. They know that people who are employed have health insurance typically. Often the policies are good. They want the people, who do not work, to have the same health insurance as you do. They want the people who never put a dime into Medicare to have the same health benefits as retired Seniors. The only way for Congress and Obama to do that is to redistribute your healthcare. Since your employer Is not going to pay for people who do not work for the company, and Medicare right now, will not pay for those who are not entitled to Medicare. the solution is to take half of the value of your plan and give it to somebody else. Additionally, they have already taken 1/2 of Medicare (about $600 Billion payout from Medicare is in the bill) and have given it to somebody else. This is called Healthcare Redistribution and it means that those who earned their health insurance, even Seniors who earned Medicare, will give it up for weakened insurance policies so that in the end, all policies are the same and there is equality. Obama wants you to beleive that by taking $600 Billion from Medicare and giving it to Obamacare, he has helped Seniors. DOes he think we are idiots? There may be no healthcare but there will be equality. Is this why you sent your Congress person to represent you? Rationing, longer lines in the doctors office and reduced care are the natural effects. It is a bad bill and it will hurt a lot of people who wake up and find themselves on the outside looking in. The next step is to actually call the program "healthcare rationing." At a $trillion dollars in cost, the money is coming out of somebody's pocket. It is not Senator Casey's pocket. It is your pocket. Moreover, as noted, $600 billion is coming from reduced Medicare benefits. I think that with sound conservatism and constitutionalism and a respect for our founding fathers that we can avoid this eventuality. Using many of the principals that Ron Paul and Alan Keyes have been writing about these past years, we can save America and we can all have good Jobs. First we have to get rid of the perpetrators -- the House and the Senate of the USA. I could go on like this, and I do. You can get a pretty complete story on my this Web page. But for now, let’s ask what can be done. It actually is complicated but understandable. First, we need to face the truth: We’re in bad shape. Then we need to unite--left and right, black and white, male and female, young and old--behind a simple truth: The United States of America was created to be a Republic, not a Monarchy, and not a socialist state. It’s time to restore the Republic starting with the next time we all vote in Pennsylvania by putting in a brand new Congress in office with ties to nobody but the people. I am asking for your vote to help get this done. Our first order of business in the new Congress will be Jobs Jobs! Jobs! I would love to be the Senator to sponsor this legislation for you. It is up to Pennsylvanians to assure this happens.